Updated 22nd February to show a revised release date. 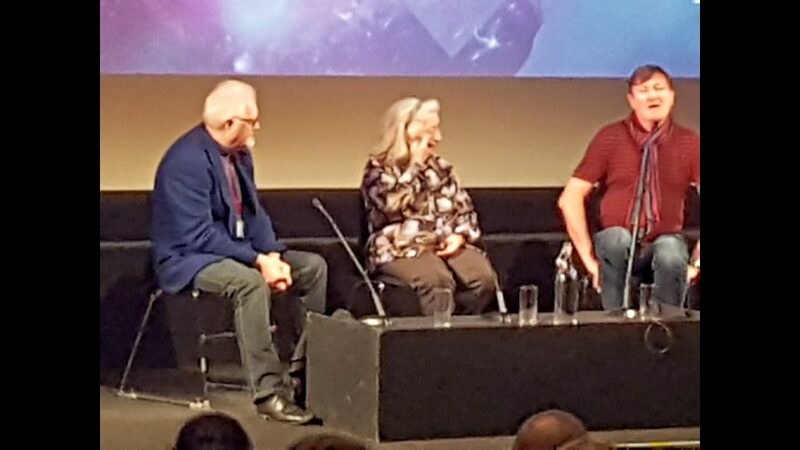 The Doctor Who Season 18 Blu-ray is released on Monday 25th February and to celebrate the BFI (British Film Institute) on the London Southbank recently ran a special event showing the final 4th Doctor story Logopolis, this version having updated special effects. These events are always fun to attend because you know everyone in the room is a fan and there’s such a positive vibe in the auditorium. I think this is partly due to the BFI hosts who do everything with such humour and love during these events. So off I went on a beautifully sunny spring day to Southbank to view this landmark story. I call it a landmark as Logopolis does have a special place in my heart because in it one of the most famous Doctors ever the magnificent Tom Baker left the role that brought him to prominence and made him a household name. As a young girl, I was aware of the ‘bigness’ of Tom Baker and it strikes a chord with me every time because it is his last story. Is it the best story he could have gone out on? Personally, for me yes. I love Keeper of Traken and the continuation of that story with the Master continuing to wreak chaos makes sense. Regarding the story itself, the script is actually quite skilled in that it emphasises the light and shade in Tom Baker’s performance in Logopolis. He is a timelord who does look tired from the energetic character who bounded into his first series but he still has his trademark eccentricity, snapping at Adric at times, directing his dry humour mainly at his new bolshie companion Tegan. I notice the 4th Doctor likes to conjecture to himself a lot and Tom Baker doesn’t always look at other people but it does add to his general intensity. There is also a strange thing that happens when you see a story on the big screen with other people. There are bits in scripts you never imagined are comedic when you are on your own but suddenly you see them through other peoples eyes and they become funny. When Tegan bursts into the console room and demands to see whoever’s in charge of the Tardis the look between the Doctor and Adric is priceless. Another moment which may be a Tom Baker idiocrasy is when the Doctor is telling Tegan about her aunt in the central registry and she turns away to cry. He pats her back awkwardly and then just shoves her away which gained hearty guffaws from the audience. But then there is the contrast of a kind of brooding sorrow in his face at knowing the future but ‘the end has been prepared for’ My opinion is Tom Baker may have had mixed feelings during his last story. 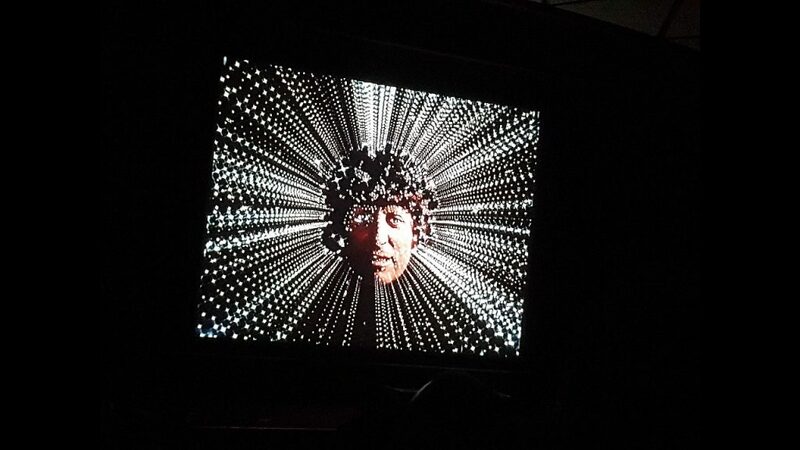 Christopher Bidmead revealed a tradition that every year Tom Baker would meet with the then producer and there would be a discussion where he would say he should leave and a dance would occur where the producers would cajole him to stay. When he met with John Nathan Turner and Chris Bidmead the same yearly conversation was had but when they actually agreed Tom should go, Bidmead intonated, it left Tom crestfallen. I do enjoy Christopher H Bidmead’s writing. I don’t know how scientific the concepts were to create the story but I prefer it to love saving the day. It works much better I think and the idea of recursion used within mathematics is fascinating as we see a Tardis within a Tardis repeated many times. Block Transfer Computation may be a made-up concept but the making of reality with numbers is much like the Carrionites did with words. There’s a really good cliff-hanger due to the Master’s meddling as the TARDIS is reduced in size. DOCTOR: Who is she? Where did she come from? What are we going to do with her? TEGAN: You can take me right back where you found me, Doctor whoever you are. My aunt’s waiting in the car to take me to the airport. DOCTOR: Your aunt? Woman in the white hat, red sports car? DOCTOR: Well, a little of her. That settles it. She’s got to come with us. Other elements which work are The Watcher. I’m glad as an audience we never hear the conversation between the Doctor and the Watcher. For once we are in the dark as much as the companions. It’s the right thing that the mystery of the Watcher is kept hidden until the conclusion of the story. He is clearly an ally, a ghost of things to come, who brings Nyssa to Logopolis and who will protect the companions whilst the 4th Doctor does what he has to do. The incidental music for the Watcher is superb. I also like that we don’t see the Master for a couple of episodes but we know he is there by the masterly chuckle and that nicely builds the tension because we know he has killed a policeman and Aunt Vanessa before he even gets to Logopolis. Its one of Anthony Ainley’s stronger performances and I do wonder if it is because of Tom Baker’s big presence where his mania is purposely held back. There’s an evil but calm edge as he seeks to control Logopolis and puts the Universe at risk with his plans. Against Peter Davison, the Master does become a bit more ‘panto’ in later stories but here the Timelords have to join forces. I noticed the Doctor’s revulsion at considering even having to shake hands with him! This is the story that re-introduces the three-companion set-up and whilst it didn’t last it brings back nostalgic memories of this large team. Adric being alone in the pupil role with the 4th Doctor worked and it’s a shame that Nyssa’s arrival derailed that position somewhat and Adric then would dislike Tegan. Tegan’s introduction with her Aunt is a strong one with a lot of time spent getting to know her in the first and second episode stuck on the Barnet Bypass. before she even meets the Doctor. Janet Fielding is occasionally unsubtle but I can’t fault her impact. Logopolis is I’ve realised in part a tragedy in that you do end up caring about the supporting characters that die such as Aunt Vanessa and the mathematicians of Logopolis. I thought The Monitor was a sympathetic kindly character well conveyed by John Fraser and seeing Logopolis fall and literally crumble is added pathos. Nyssa’s arrival is a surprise but allows for references to the previous story (a strong performance for Anthony Ainley as Tremas) with the bracelet and Nyssa’s believing the Master is her father. Nyssa’s reaction to how The Master has destroyed her family, her home which is dwelt on very briefly, a normality of classic Who, is a heart-breaking moment. But it is also a tragedy for the Doctor. The regeneration scene for the 4th Doctor comes in at number 3 in my all time favourite regenerations I think what I really enjoy is there is a kind of quietness about the whole sequence. The Doctor falls from the scaffolding and then there is this epic scene where the 4th Doctor lies on the ground. The music swells and whilst having Nyssa, Tegan and Adric call out “Doctor” is a somewhat artificial moment, seeing the older companions in flashback and the 4th Doctor utter those immortal lines: ‘It’s the end. But the moment has been prepared for’ is classic. As the Watcher merges with the Doctor the music at this point is fantastic. I adore the whole scene and watching it again gave me goosebumps and made me miss his Doctor all over again. The structure of the screening was after the initial giveaways(there were a few boos for the series 11 DVD giveaway! ), there were 2 episodes shown, two guests came on Production Manager Margot Hayhoe and actor Adrian Gibbs (the Watcher) and then the last two episodes and then two more guests Script Editor/ Writer Christopher H Bidmead and actor Matthew Waterhouse. Of the first panel of invited guest’s production manager Margot Hayhoe and actor Adrian Gibbs (the Watcher) it’s amazing to find out Margot Hayhoe has worked with four doctors. She was assistant floor manager for “The War Machines” (with Lovett Bickford), “Fury from the Deep”, and “The Ambassadors of Death” Margo was also a production manager for Logopolis, Castrovalva and Snakedance. When quizzed who was her favourite Doctor she said Patrick Troughton but thought Peter Davison was very good. She found Jon Pertwee ‘a delight,’ he gave her a jumper when she said she commented she liked it on him. William Hartnell, she met as a very young assistant floor assistant and remembered she had to be very polite to him. Adrian Gibb wasn’t credited as the Watcher but recalled the scene on the bridge with Tom Baker. They were directed to make gestures but weren’t told what they were meant to be saying to each other. The face mask he remembered was constricting and as he was wrapped in bandages he felt very warm whilst everyone else was freezing. Adrian Gibbs also played Rysik in “Full Circle”. He also had uncredited roles as a dancer in “Black Orchid”. 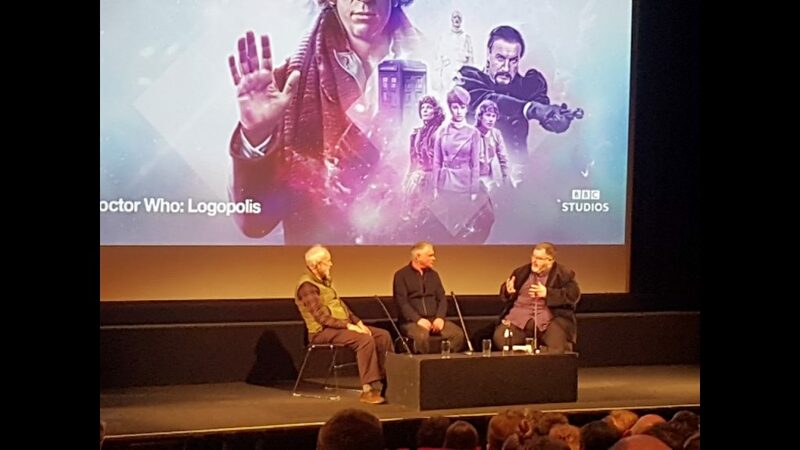 After the conclusion of the actual story Script Editor/Writer Chris Bidmead and actor Matthew Waterhouse came to the stage and their interviewer Mathew quizzed them both about Logopolis and Season 18. Chris revealed that the name Adric came as an anagram from the mathematician and theorist Dirac but he couldn’t actually remember Matthew Waterhouse’s audition. The interviewer pressed him whether there was a plan but he revealed how stressful it was, he was just too busy, writing just as it came. He explained that there was such a time pressure to have the scripts that there was no time to plan a shape as nowadays with an arc where stories interweave with each other. There was also discussion of the difficulties of working with Tom Baker who had definite ideas about how the Doctor should be played. Chris said “Tom’s views of the character was of no interest to me at all… I mean in the arrogant way of a quite young man of 35, once I got the job as script editor I understood the show” The production team fought against if Tom Baker went off script where sometimes they would have to have quite strong words with him. Chris was he said was passionate about story development whereas Tom Baker wasn’t. Matthew Waterhouse talked about the order of filming and how excited he was to be a part of the show. As a Doctor Who fan himself, he had read the Target novels and was really excited for his first recorded show “State of Decay” to be by Terrance Dicks describing a feeling of ‘nothing purer’ to be in one of his scripts. He also described how working with Lalla Ward and Tom Baker wasn’t always ‘a bundle of laughs’. Tom Baker has recognised in his later years that he may have behaved poorly back then. Matthew acknowledged as Chris did that how a recording went was very dependent on Tom’s mood as that Tom lived in the moment. His performance would change depending on whether he had a row with his leading lady and eventual wife Lalla. Overall though Matthew felt he was treated well by Tom Baker. The interviewer commented on how Matthew was fabulous in this story which he took with very good humour. I really like Matthew Waterhouse. He gets a lot of criticism for his performances at the time but is now able to articulate his experiences really well. Chris Bidmead comes across as someone who wanted the best for the show but was working under difficult conditions. Both he and Barry Letts agreed that the series had become a bit silly and needed to have stories based on more scientific principles as well as needing a fresh look to be brought into the 1980s. Its a real shame he only did around a year on Doctor Who because I think he brings a thoughtfulness to this script a real emotional melancholy that I like. He recounted that he asked for a thirty per cent pay rise because of the amount of work he was doing from the BBC. They talked about the various pay scales for roles in the BBC and they said no. With again he said the arrogance of youth he said he would leave and did but he says he wanted to stay. So the BFI event ended after a question and answer. It was a shame there wasn’t a signing by the guests at the end but the BFI did put on another brilliant event as they always do. Roll on the next event. I’m ready. Doctor Who – The Collection – Season 18 Limited Edition Box Set is released on 11th March 2019 priced around £40. Next week our review will be the 3rd Doctor story – The Mutants. Until then have a great week and until next time – Allons-y! It sometimes feels that, after 56 years, there’s little left to surprise you about Doctor Who. Thanks to the efforts of your Keith Barnfathers, Andrew Pixleys and Toby Hadokes, there are surely very few stones left unturned in our quest for Who knowledge. 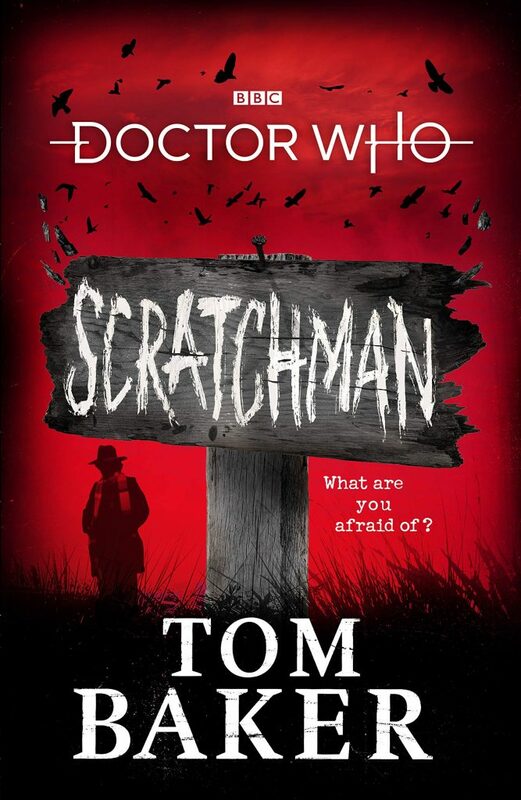 And yet, Tom Baker’s new novel Scratchman is one of those rare things, a surprise. Baker’s ability to craft a macabre and magical adventure was never in doubt for anyone who’s read interviews or his previous two books Who on Earth is Tom Baker? and The Boy Who Kicked Pigs. What catches the reader off guard is that Baker has also managed to give us an emotionally robust Doctor Who story about what it means to be the Doctor in an affectionate and affecting tribute to the character to whom he, and we owe so much. The behind the scenes story of Scratchman is well documented, but we’ll briefly return to it. Back in the 1970s, at the height of Baker’s powers, he and Ian Marter cooked up a Doctor Who feature film script which would pit the Doctor against the Devil. Inspired by Ken Russell’s Lisztomania, there would be evil scarecrows, Daleks, a giant pinball table, and Vincent Price would play the Devil! Whilst the idea found a writer and director in the form of James Hill, and got to the script stage, it was never produced and has remained one of Doctor Who’s few unanswered What If questions. Tom Baker, with the help of prolific Doctor Who author James Goss has finally adapted his movie as a novel from BBC books. Much of Baker and Marter’s original ideas remain, with a sprinkling of nods to a future that would have been inconceivable in the mid-1970s. The Doctor, Sarah and Harry materialise on a sleepy Scottish island where an ancient power is turning the villagers into twisted, terrifying scarecrows. 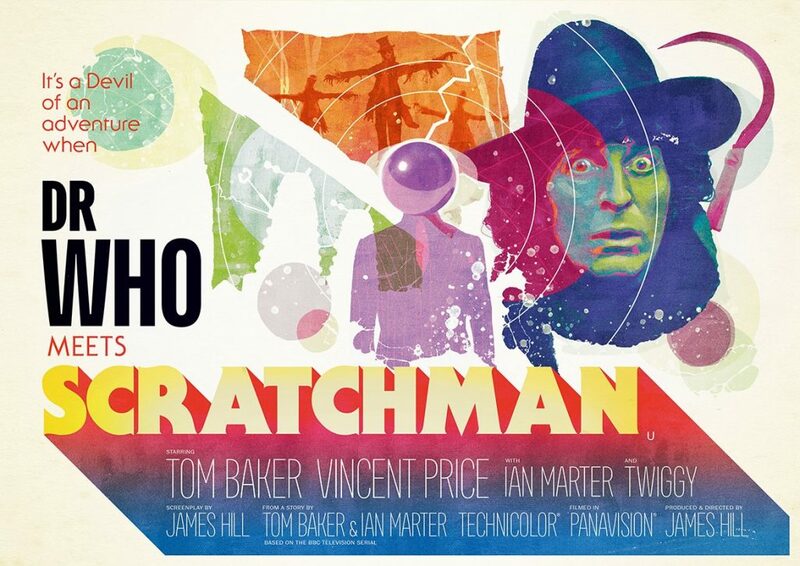 In their attempt to save the villagers, the Doctor and his friends end up in a mind-boggling battle with the Devil himself, the titular Scratchman. Some concessions are made to the fact that this is a novel rather than a feature film. Instead of unfolding like a traditional adventure, this is a story told to the Time Lords, by the Doctor to delay his execution. The Gallifreyan Nights, if you will. The book is therefore written in the first person, from the perspective of the Doctor himself. Such a narrative device was always a bit of a no-no in Doctor Who books from the Target days onwards. However, if any writer could give their readers an insight into the impossible mind of the Doctor, it’s Tom Baker (and, for good or ill, Steven Moffat). It’s always been difficult to tell where Baker begins and the Doctor ends, or indeed vice versa and that vein of ambiguity runs through every page of Scratchman. There’s that tone of melancholic, wistful nostalgia that inflects much of Baker’s recent contributions to the Classic Series’ BluRay range. The Doctor’s fondness for his companions Sarah and Harry is clearly rooted in Baker’s own affection for his friends Elisabeth Sladen and Ian Marter, both of whom are sadly no longer with us. Baker’s sense of mischief is another thing that leaps off the page. There’s a cheeky reference to Worzel Gummidge that you can picture the Fourth Doctor delivering to camera with a wry grin and glint in the eye. He also deploys some wonderful, evocative turns of phrase which delight and disgust in equal measure. Passages like that call to mind some of the more grisly moments of an Ian Marter or Gerry Davis penned Target novel as well as evoking the “Hammer horror at teatime” feel of Baker’s early years in the role. Doctor Who has a decades-long association with novelisations and original stories but Scratchman is something utterly unique. An authentic slice of gothic horror by way of Holmes and Hinchcliffe, and a fascinating insight into both the character of the Fourth Doctor and the actor who played him. Indeed, the letter from the Doctor that closes the novel is as much a letter from Tom Baker as it is from our titular Timelord. “I hope I’ve been a good Doctor. I hope you’ve enjoyed having me around.” It’s something of an understatement to agree that Tom has been a good Doctor, and it’s been noted time and time again how wonderfully he weaves a yarn. How brilliant it is to have this novel, which is the perfect combination of Tom Baker the storyteller and Tom Baker the Doctor. It may have taken over 40 years but Scratchman has definitely been worth the wait. 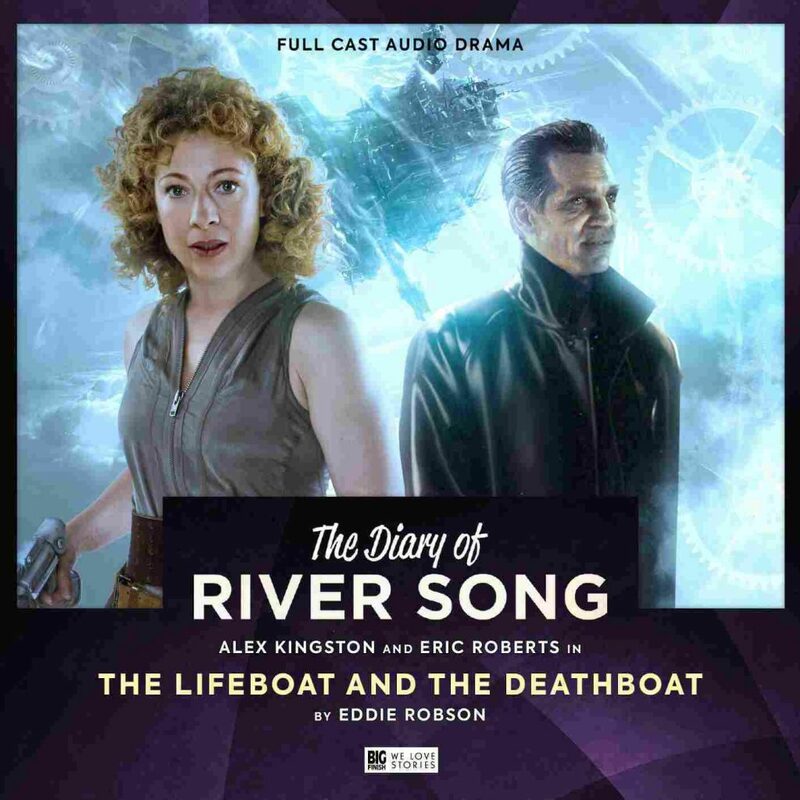 The Diary of River Song: Series 5 continues to pit River Song against various famous faces from across the Doctor Who universe. With Series 4 having brought Tom Baker’s Fourth Doctor into the fold, Series 5 sees River come up against the Doctor’s arch nemesis, The Master, in many incarnations of that character. This is my first foray into the world of River Song at Big Finish so the question is, did I enjoy it? 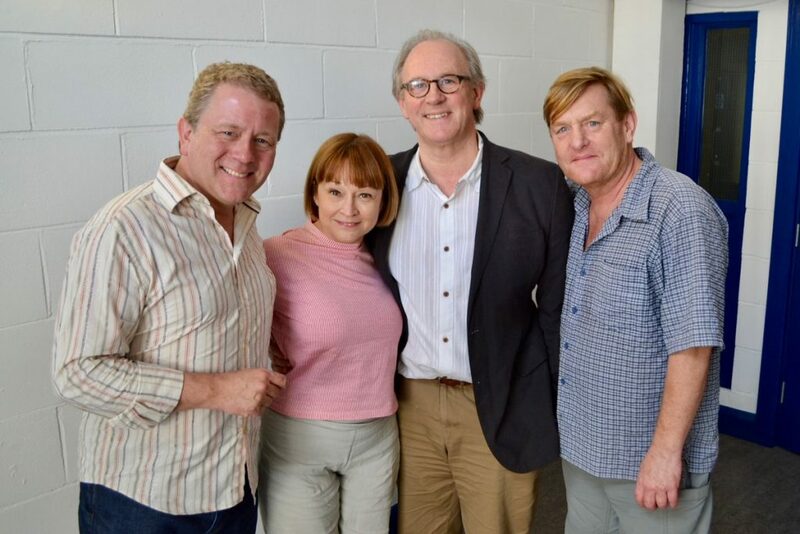 Jonathan Morris has one of the most challenging things to do with The Bekdel Test and that is bringing Michelle Gomez into the world of Big Finish. Ahead of her own boxset due for release in February, this is a good look into how her own series is going to pan out. And to his credit, Morris does a very good job. He forces two characters who are direct opposites to work together and then lets us watch the chaos that ensues. Missy is the same crazy version of the character that she was on television and Michelle Gomez seems completely at home with her character on audio. Indeed, Morris makes the absolute most of the great chemistry between Alex Kingston and Michelle Gomez with a number of little moments which are laugh out loud. We’ve got one little scene where River goes through every rogue Time Lord in existence including the Rani and The Meddling Monk before she works out who Missy is. Gomez pitches Missy’s disgust just perfectly! How could anyone not know who she is?! And there is a great throwaway line to the Comic Relief special, The Curse of Fatal Death! It is a reference that only Doctor Who fans will probably get but it is a great one! Well done Mr Morris! 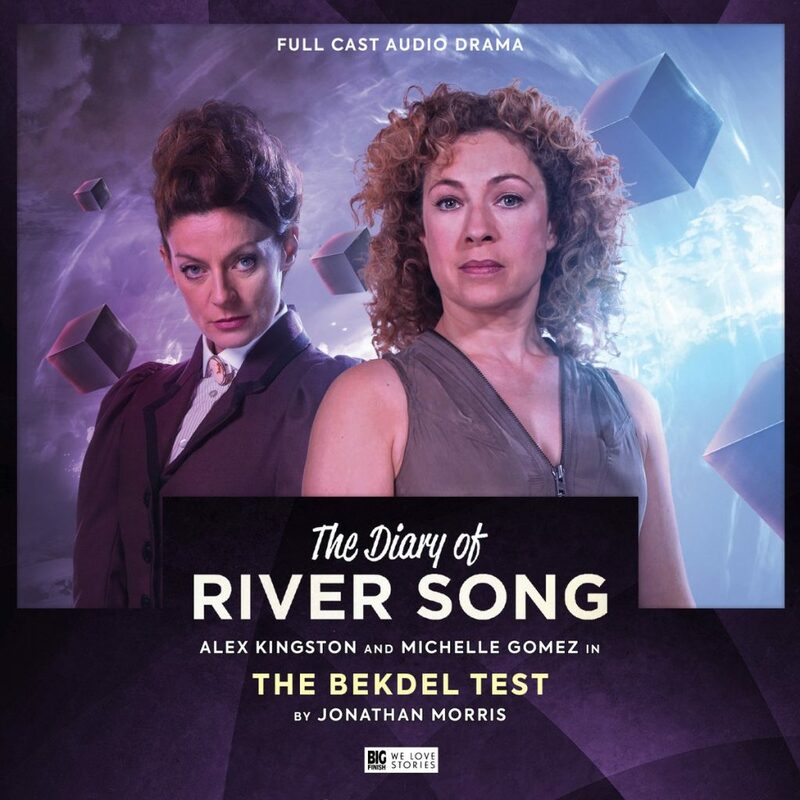 With this being my first time listening to The Diary of River Song, I was impressed with how good Alex Kingston was on audio. River Song is perhaps one of those marmite characters amongst fans, many love her but there are just as many who unfortunately don’t. I must admit to being someone who quite liked her character and Kingston’s performance in particular. There were moments where Stephen Moffatt would go a little too far with the innuendoes, but that isn’t a problem that Morris has. He keeps things tense and interesting and litters the script with plenty of twists and turns. There were a couple of moments which surprised me and the supporting cast was excellent too. The Bekdel Test was a great way to open this set and kept me excited for the next adventure and the upcoming boxset for Missy herself, one can never have too much Michelle Gomez! 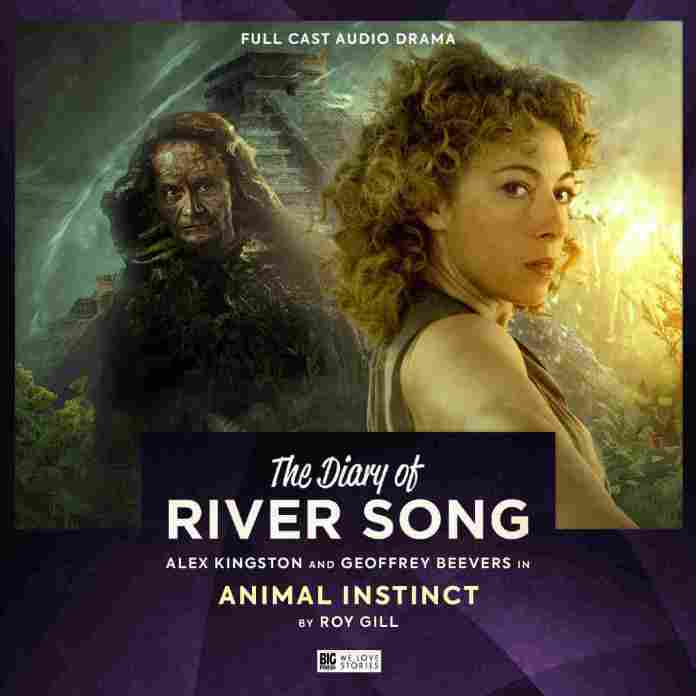 The second story for this set, Animal Instinct sees River Song coming up against perhaps the evilest incarnation of the Master, Geoffrey Beever’s decayed Master. Author Roy Gill is really good at keeping the Master’s identity a secret from River Song at first as this is perhaps the incarnation that casual viewers are less familiar with. With River Song and her assistant Luke stumble across an ancient temple and stumble into a trap set for the Doctor. Waking the Master up from his stasis pod, they soon discover a secret history for this world and how that ties in with the plans of The Master. Roy Gill has gradually garnered quite the repertoire at Big Finish with his work on The Omega Factor range being standouts for me and he really has a handle on things here. His characterisation of River is spot-on, making her a much more Doctor-ish character than she is over the rest of the set. And Alex Kingston works brilliantly alongside Geoffrey Beevers. The pair have fantastic chemistry, Beevers’ silky voice and Kingston’s quite loud tones sound really nice together. What really works quite nicely is that there are a few moments here and there, where this Master seems to rub off on River, causing her to make some surprising decisions and giving us some nice little twists here and there that catch us on the wrong foot. One thing that Gill hasn’t forgotten to inject though is some elements of humour. As well as being perhaps the most callous incarnation of the Master, Beevers can also be one of the funniest. His Master has no understanding of the way humans work and that is clear here when he comments on how River manages to control Luke without the use of shocking weapons and threats. Kingston’s disdain at the comments help really sell the scene and Beevers’ genuine surprise at how this can work is hysterical. The supporting cast here is great again, providing more than a little cannon fodder for the Master but the actors make their characters so likable that when one of them bites the dust, you really feel it. Overall, this is another strong entry to the set and another enjoyable stand-alone story to boot. The third story of this set is perhaps the most surprising of all and certainly garnered a lot of the focus in the different media outlets that jumped on it because it was a slow news day. Eddie Robson was given the hardest job of all here in the form of bringing back Eric Robert’s TV Movie version of the Master. Setting his story on board a floating mishmash of a ship stranded in the time Vortex, he gives the Master just one location to work from and this, in turn, allows us to get a good look into where his mind is at. The biggest problem with the TV Movie for me is the way the Master is written, by people who claim to have been fans but have clearly never seen a Master episode of Doctor Who in their lives! That isn’t the case here and Robson gives this ridiculed version of the character some much-needed dignity. Eric Roberts for his part does a damn-good job in the role. Being the only American in the cast, it isn’t difficult to work out who he is but I must admit I was a little flummoxed at the beginning, as he sounds absolutely nothing like he did on television. Of course, Roberts is older now and naturally, his voice would change but it took me a while to work out it was him! The change in tone for his voice though is a great thing because he gets across a much softer side of the character before snapping into evil-Master mode at the end. And although we still get a couple of theatrical moments, things are dialled down much more nicely and Robson and Roberts give the character a new lease of life. Hopefully, this won’t be the one-and-only time we hear from Eric Roberts with Big Finish, perhaps a rematch against the Eighth Doctor is now on the cards? 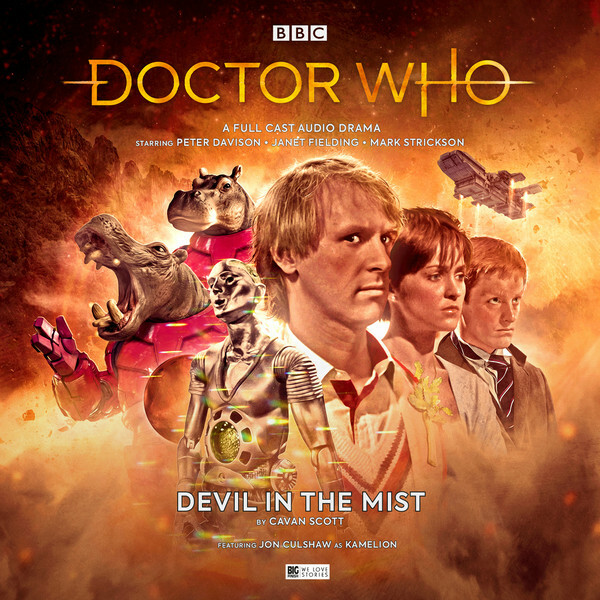 Robson has proved time and time again that he can handle some of the timey-wimey aspects of the show expertly, especially when it comes to bridging some of the confusing gaps or mistakes in continuity between the modern series and the classic series. He does this again in a rather imaginative way to explain how the Master survived the events of the television movie and for the most part it works, though it does stretch the imagination a little. But the rest of the episode is so enjoyable that you can forgive this little hiccup. The Lifeboat and the Deathboat is a surprisingly enjoyable story which allows the TV Movie Master a time to shine. Eric Roberts has great chemistry with all the main and supporting cast and hopefully we’ll hear more from him again in the near future. And hopefully, his successful turn here will finally make the production team behind the TV Movie give Big Finish the rights to the characters of Grace Holloway and Chang-Lee. Now there’s a boxset I’d be the first in line to purchase! The fourth and final outing in this set, Concealed Weapon sees the return of another evil incarnation of the Master, Derek Jacobi’s War-Master. Written by Scott Handcock, who perhaps has the best handle on this incarnation, The Concealed Weapon is another great story and a great way to close out the set. Over the few years that he has been working with Big Finish, Derek Jacobi’s War Master has quickly become one of the most evil versions of the character since the character’s creation. With the Time War raging all around him, this is a Master who has gone a little more insane and just doesn’t care anymore. I’ll never get over his treatment of his ‘companion’, played by Jonny Green in the Only the Good boxset and here, his treatment of the supporting characters is just as vile. Perhaps the best thing about this story is that River Song knows exactly who this Master is. We’re given no explanation as to how that is possible but we don’t need one as there is a real sense that she has no idea how to stop him. Almost throughout the entire story, the War Master has the upper-hand until River Song finally puts a stop to him at the end but there is a real sense of threat and unease as his plans begin to take form. As with any good Master story, it ends with his plans coming down around his ears but it is a lot of fun getting to that stage and Scott Handcock makes sure he gives us plenty of misdirection in the meantime with characters shifting or having shifted allegiances throughout the piece. With the series being headed by Alex Kingston, this story really is Jacobi’s show and it is clear how much he revels in being thoroughly evil! The Diary of River Song: Series 5 is a massive success plain and simple. It has four incredibly strong stories all penned by competent writers. The whole cast, main and guest for all stories do a terrific job and for my first foray into this range, I was incredibly impressed. All the Master’s were used incredibly well, Michelle Gomez is always a delight as is Geoffrey Beevers and Derek Jacobi but we know they all are, the biggest surprise was certainly Eric Roberts who stepped up to the plate brilliantly. If this set proves anything it is that River Song doesn’t need the Doctor around to deliver some cracking storytelling. 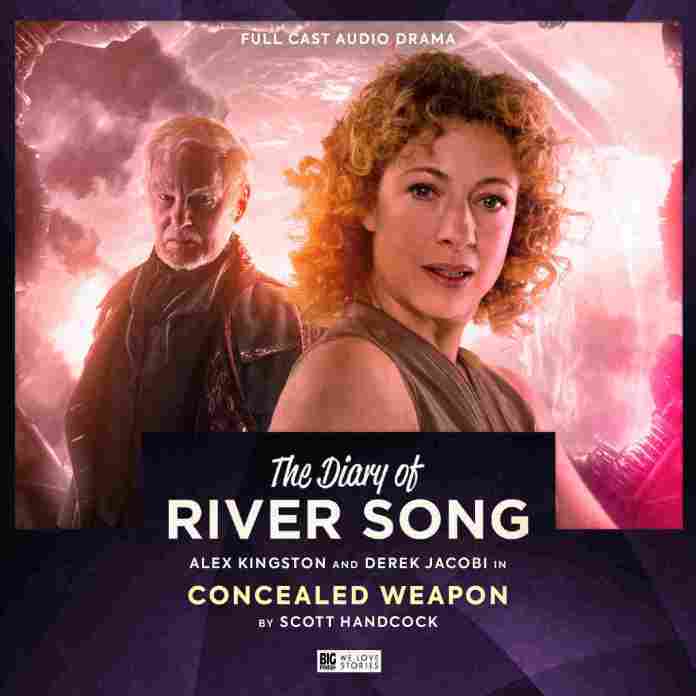 With the range having been commissioned for a further two sets, the future seems bright for River Song. We’ll next hear from her in the upcoming Legacy of Time and Ravenous: Vol 3 and Alex Kingston will head Transcendence, a Big Finish original. It seems that Alex Kingston is going nowhere anytime soon as so long as the sets she is part of are as strong as this one, I’ll be there!